This supplementary document is intended as a reference guide to various accounts of the events of Thursday, October 30, 1975 and Friday, October 31, 1975. The objective was to create a concise sequential record of circumstances immediately leading up to, and following, the murder of Martha Moxley, in order to illustrate conflicts in testimony, the actions and whereabouts of suspects, and points of interest worthy of further investigation. While this time-line includes multiple and often opposing perspectives, it is by no means comprehensive. As much as possible, specific details and their reported time of occurrence have been attributed to the proper source and context. It is important to remember that times should generally be viewed as approximate and subject to reasonable variance. 6:00 pm--According to local resident Mrs. Jean Walker, interviewed on 9/14/92, her daughter Marjorie, receives phone call from Martha Moxley, inviting her to go out. At her mother's insistence, Marjorie declines. --FROM FOLIO 101, 103, John Moxley, interviewed on 11/5/75, reports that he left home for the evening. 6:30 pm--According to Steven [Stephen] Skakel, he is eating a chicken dinner in the kitchen at the Skakel residence with David Skakel and Nanny Sweeney. --FROM FOLIO 34, Officer Charles Morganti reports seeing a white Volkswagen parked on Walsh Lane. According to Rushton Skakel Sr., the car belongs to Frank Wittine. 7:00 pm--According to Tommy Skakel, from his interview on 10/7/93 [footnote 1] with Willis Krebs, this is the approximate time he left for dinner at the Belle Haven Club with Michael Skakel, John Skakel, Rush Skakel, Julie Skakel, Jim Terrien, Andrea Shakespeare, and Ken Littleton. 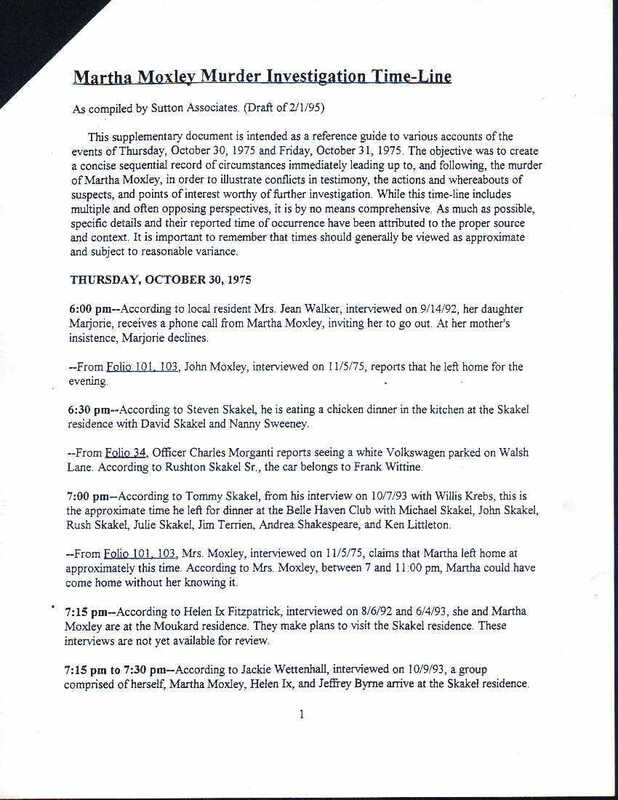 --FROM FOLIO 101, 103, Mrs. Moxley, interviewed on 11/5/75, claims that Martha left home at approximately this time. According to Mrs. Moxley, between 7 and 11:00 pm, Martha could have come home without her knowing it. 7:15 pm--According to Helen Ix Fitzpatrick, interviewed on 8/6/92 and 6/4/93, she and Martha are at the Moukard [Mouakad] residence. They make plans to visit the Skakel residence. These interviews are not yet available for review. 7:15 pm to 7:30 pm--According to Jackie Wettenhall, interviewed on 10/9/93, a group comprised of herself, Martha Moxley, Helen Ix, and Jeffrey [Geoffrey] Byrne arrive at the Skakel residence.